Background: Sarah Hillary attended the Cleaning of Acrylic Painted Surfaces workshop held at the Tate Britain, London, 3-6 July 2012. The cleaning of acrylic painted surfaces workshop (CAPS) was offered because of the challenges involved in the cleaning of works of art painted in acrylic. A great deal is known about the treatment of oil paints which have been around for hundreds of years, but acrylic emulsion paints are relatively new (first used by artists in the 1960s) and very complex with many additives, making identifying safe and effective cleaning solutions difficult. In addition, the full effects of different cleaning systems on the paints themselves are not widely understood. Communicate the results of recent scientific research and new developments in practice. 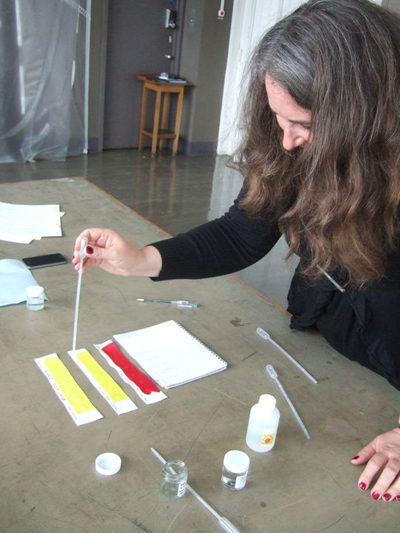 Stimulate a dialogue between researchers and conservators about the application of new research and technical insights to the conservation of acrylic painted surfaces. Develop critical thinking skills that will help participants design project-specific cleaning systems in their own labs. Identify areas where further research is beneficial. The lectures covered new research, technology and practical advances, much of which had been developed by the course instructors. 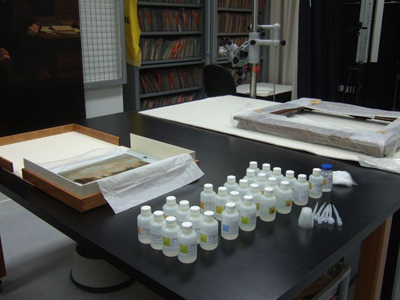 An equal amount of time was spent in the painting conservation laboratories doing practical work, so that we could test and assess the many different approaches. All participants were given a test kit of 28 cleaning solutions to use when we returned to our workplaces. The CAPS workshop at Tate Britain built upon an earlier colloquium and workshop on the subject (Getty July 2009 and MoMA May 2011). These events gave the instructors an opportunity to develop the workshop program and were for specific audiences and invitation only, but the Tate workshop was offered internationally and incorporated new developments. There were 47 applications for the 14 places, and the participants came from museums (such as the Pompidou Centre, the Academy of Fine Arts Vienna, the Andy Warhol Museum, the Dublin City Gallery and the National Gallery of Australia) and private practice. Most participants were painting conservators, but there were also two sculpture conservators and one textile conservator. In addition, four conservators from the Tate attended. These workshops are part of the GCI’s Research into Practice education initiative. This seeks to advance the practice of conservation through a series of workshops and other educational activities that draw on both new scientific research and the conservator’s perspective to improve understanding and treatment of conservation problems. A website had been set up for the workshop so that participants could access the required reading before the course, and then after, to download the PowerPoint presentations and technical information. There was a huge amount to get through during the four days, and we moved between lectures and practical sessions. 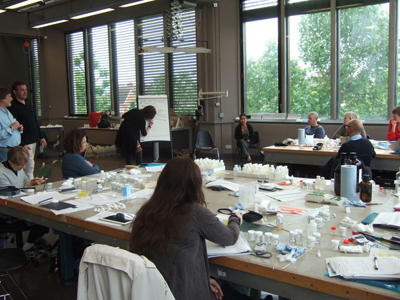 The participants were given every opportunity to test a wide range of solutions and to come to our own conclusions but it was extremely helpful to have the world experts in the field of acrylic paint research present to answer our questions. All of the participants had a particular interest in the treatment of contemporary art and so this resulted in lively and useful discussion. Acrylic emulsions are complex and include many additives. Aqueous cleaning is the best way of removing dirt but will also remove original material, particularly surfactant (which is used to stabilise the liquid emulsion). The main research focus has been to find a way of modifying the water so that it can remove the dirt but not cause damage. The processes that have been developed include the modification of pH and conductivity, the addition of chelating agents, detergents and gels, as well as using micro-emulsions, which tie up the water in a mineral spirits. The use of varnishes for protecting outdoor acrylic murals was also discussed, as it is possible that this research could be useful for gallery paintings eventually. By using varnishes that are soluble in water that has a pH 7 (which is higher than rainwater), means that the coatings can be removed without damaging the painting and without using toxic solvents. The cleaning solution kits are to be used with the Modular Cleaning Program, which can be downloaded from the internet [http://cool.conservation-us.org/byauth/stavroudis/mcp/]. By giving us our own sets of cleaning solutions to take back to our workplaces, it is possible for us to use the cleaning methods immediately. I am hoping to use them on a painting by Gordon Walters that is in the AAG conservation studios currently. It is important that I pass on the information that I have learnt on the workshop to my colleagues and so I am giving a talk to the Auckland group of the NZCCM on 7 August and writing a report for the next NZCCM Newsletter in September. In conclusion, the workshop was well organised, very informative and will have immediate practical outcomes. 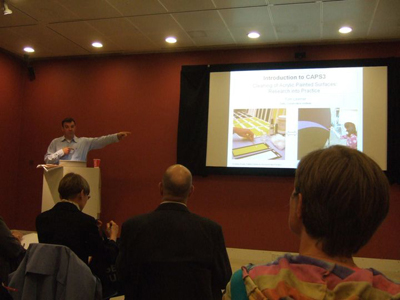 It was also a fantastic networking opportunity with conservators at the forefront of modern paints research and those with an interest in this area from around the world. I would like to thank National Services Te Paerangi for providing the Helping Hands Grant of $1000 towards the cost of attending the workshop. The remaining expenses were self-funded and study leave was provided by the Auckland Art Gallery, Regional Facilities Auckland. I’m very interested in these cleaning processes regarding acrylic painted surfaces. Do you know any publication which covers the latest technologies / methods for these cleaning processes?